Two of the worst types of account delinquencies are a debt collection and charge-off, both of which are the result of not paying a bill for several months. Because they show a serious late payment (which is 35 percent of your credit score), charge-offs and debt collections are terrible for your credit score. Fortunately, with some effort, you can overcome the damage done to your credit. If you have a collection or charge-off that's not yours or that's not reported correctly, you can dispute the error with the credit bureaus. To dispute a credit report error, write a credit report dispute letter explaining why the account is inaccurate. Include a copy of any proof you have to help the credit bureau with their investigation. 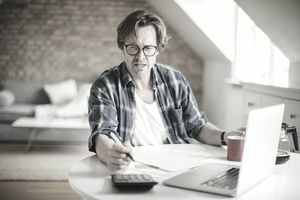 If the error isn't deleted after you dispute with the credit bureau, you can dispute the account directly with the business that listed it on your credit report. You're allowed to sue a credit bureau that doesn't remove disputed errors from your credit report. Hopefully, you won't have to go this route, but save copies of everything related to your dispute in case you have to take legal action. Here’s the thing: paying off a charge-off or collection balance won’t delete the item from your credit report and it won’t help your credit score right away. Once the blemish is there, the damage is done at least for the short-term. However, a paid balance is always better than an unpaid one, especially if you’re trying to get new credit or a major loan like a mortgage. Before you pay, draft a pay for delete letter offering to pay the balance in full in exchange for having the item removed from your credit report. The creditor or collector may deny your claim but it’s worth a try. Settling the debt is also an option if your creditor agrees, but keep in mind your credit report will reflect that you settled the account. A settlement can also hurt your credit score in some cases. Worst case, just pay the balance in full. Or, if the account is old, like 6 or more years, you could wait and let it drop off your credit report. The credit reporting time limit for these types of delinquencies is seven years. For a charge-off, it’s 7 years plus 180 days from the date of the first delinquency. A goodwill letter is similar to a pay for delete letter, but instead, you request that the creditor or collector remove a paid account from your credit report as a courtesy. Briefly explain why you became so late. There's always a chance that whoever receives your letter is feeling generous and will update your account. The best way to rebuild your credit after a mistake like a collection or a charge-off is to get some positive information on your credit report. If you still have active credit cards or loans, continue paying them on time. The same thing goes for accounts that aren’t reported to the credit bureaus. These can also wind up on your credit report if you fall behind on your payments. You’ll have to open up new accounts if all your other accounts were charged-off or sent to collection. You may have already experienced the difficulty in getting credit with bad marks on your credit report. A select few credit card issuers offer credit cards for rebuilding credit. Alternatively, save up a few hundred dollars and open a secured credit card. Pay your account on time and you’ll get your security deposit back. Little by little, your credit score will improve as you use your credit cards and pay on time every month. You can watch your credit score progress by using a free credit scoring service like Credit Karma or Credit Sesame. Be patient. You can wreck your credit score overnight, but you can’t rebuild it in as little time. How Do You Remove Debt Collections From Your Credit Report?